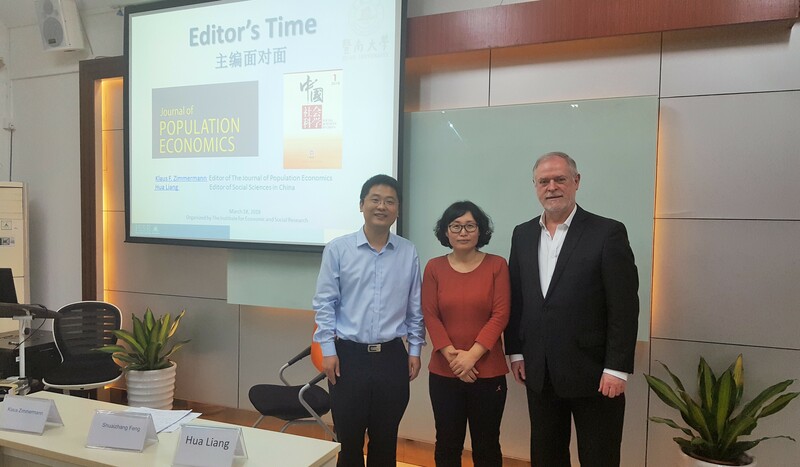 Hua Liang, the Economics Editor of the top Chinese research journal “Social Science in China” met Klaus F. Zimmermann, the Editor-in-Chief of the “Journal of Population Economics” for a thorough exchange of ideas, strategies and practices of the academic journal business. The conversation was guided by Shuaizhang Feng. 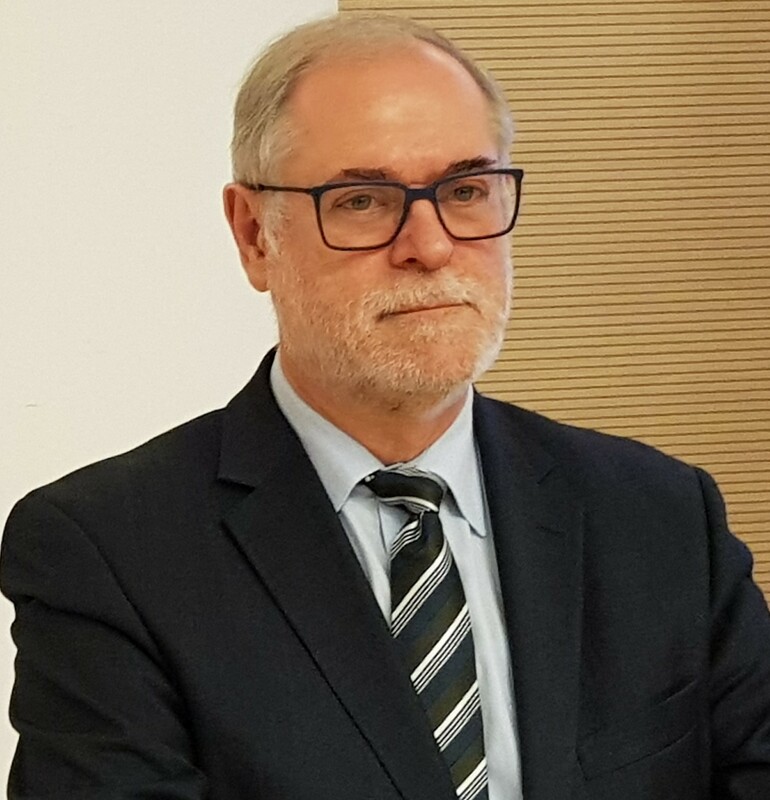 On the invitation of Professor and Dean Shuaizhang Feng, Head of the Institute for Economic and Social Research (IESR), the President of the Global Labor Organization (GLO), Klaus F. Zimmermann (UNU-MERIT, Maastricht), visited Jinan University in Guangzhou/China from March 11 to March 20. Together with GLO Fellow Feng, he had organized a joint IESR – GLO Labor Workshop that took place at Jinan University on March 13, 2018. The meeting between Editor Hua Liang (Beijing) and Editor-in-Chief Klaus F. Zimmermann took place on March 18, 2018 at IESR/Jinan University under the direction of Dean Shuaizhang Feng for two hours. The peer-reviewed Journal of Zhongguo Shehui Kexue is the top social science journal hosted by the Chinese Academy of Social Sciences. It was founded in 1980 and is committed to China-related studies and publishes in Chinese. Since the beginning, Social Sciences in China publishes articles translated to English to make them available and to seek the debate with the global world. The journal is a platform projecting new realms, trends and achievements in Chinese academic studies. It introduces the latest developments in Chinese social sciences to a foreign audience and bridges social sciences researchers and readers worldwide. It is a valuable resource for China studies with a large international impact. The Journal of Population Economics was created in 1988 and is an international quarterly that publishes original theoretical and applied research in all areas of population economics. It is peer-reviewed and covers international research on the economics of population, household and human resources. The journal is considered to be the top field journal in population economics. Micro-level topics examine individual, household or family behavior, including household formation, marriage, divorce, fertility choices, education, labor supply, migration, health, risky behavior and aging. Macro-level investigations may address such issues as economic growth with exogenous or endogenous population evolution, population policy, savings and pensions, social security, housing, and health care. For a recent review of the journal see A. Brown and K. F. Zimmermann, Three decades of publishing research in population economics, Journal of Population Economics, (2017), 30: 11-27 and the recent 2017 Report of the Editor-in-Chief. Both editors, Hua Liang and Klaus F. Zimmermann identified similar challenges for the huge responsibility to select the most important and potentially influential pieces of research from a very large inflow of highly qualified articles, although the two academic products serve somewhat different purposes beyond supporting academic excellence. Facing globalization and benefiting from international exchange were seen as chances. Both editors thanked Dean Shuaizhang Feng for his invitation to this highly productive and informative meeting. This entry was posted in Media, Research, Science. Bookmark the permalink.